Virginia man charged for killing bald eagle that was eating his fish. Eagles may no longer be endangered, but they are certainly still protected. On March 13, a Virginia man named Allen Thacker killed a bald eagle by shooting it out of the sky and then repeatedly running it over with his red all-terrain vehicle. On Tuesday, Thacker pled guilty to killing the eagle because it had been eating too many fish from his lake, the Washington Post reported. Thacker could face a fine of up to $100,000 and up to a year in jail. That’s because, in killing the eagle, he violated the Bald and Golden Eagle Protection Act. The act was first introduced in 1940 to slow the precipitous drop in the number of bald eagles in the United States—when the bald eagle was adopted as the national symbol in 1782, there may have been as many as 50,000 nesting pairs of bald eagles. By 1963, there were only 487 nesting pairs left, thanks to a combination of the pesticide DDT, a loss of habitat, and the shooting of bald eagles. A combination of efforts helped restore eagle populations—DDT was almost entirely banned in 1972, and in 1973, the Endangered Species Act started protecting eagle habitats. Today the number of bald eagles is still less than in the 18th century, but there are 16,409 nesting pairs. Michael Hutchins, director of the bird-smart wind energy campaign at the American Bird Conservatory, tells me the bird may never fully return to its historic numbers due to limited habitat, but it’s also no longer endangered. And these days, bald eagles have been spotted living in metropolitan areas like Washington, D.C; Pittsburgh; Miami; and New York City. They’re in such good shape that they’re even nesting on Staten Island. 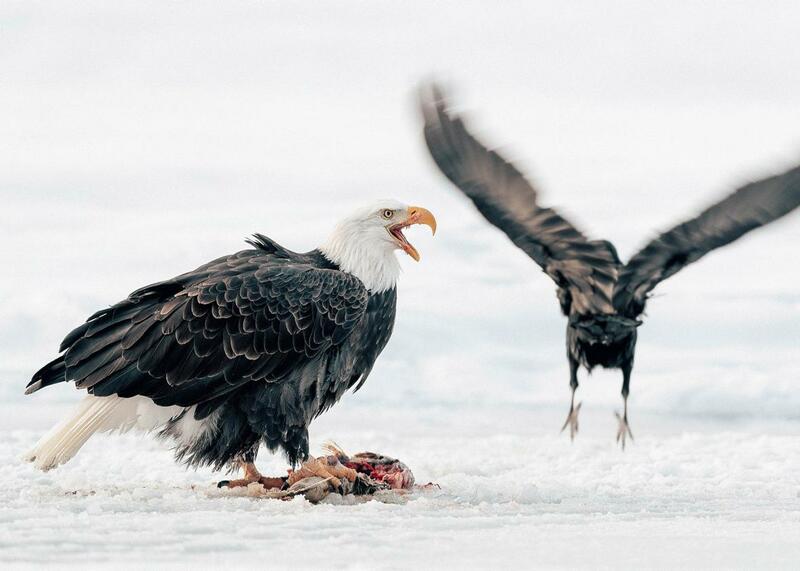 When bald eagles were at their lowest population levels, Thacker’s action would have been not just a bit aggressive; it could have been a blow to eagles’ chance of recovery. Instead, it’s just an example of what can go wrong when people interact with nature. And despite their resurgence, bald eagles will continue to be protected by the Bald and Golden Eagle Protection Act. So don’t get any ideas—even if they do go after your pets. Remember, the eagles were here first.